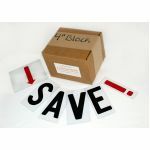 Our 4" letters are screen printed on 5" tall UV protected clear plastic panel. The UV protected plastic is .030 mils thick or about as thick as a credit card. Copy-Change letters flex or bend by hand to insert into the sign track. These letters are often used with sidewalk signs, curb side signs, reader boards, and small marquee changeable letter signs. 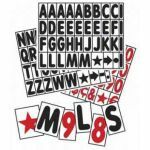 Use these letters with our .030 Sign Letter Track (texas track) and make your own custom changeable letter sign. Note: These letters are not recomended signs with letters behind enclosure doors, vandal or wind covers. Refer to Rigid Marquee Letters for enclosed signs . These are not replacement letters for Rigid letters, Gemini Letters or Zip Change Letters. Rigid type flat letters use a different type of track called "Push up drop down track". If your not sure the type of track or letter your sign uses view the "Sign Letter Track" we offer to help determine the type of letter you need for your sign.